Ethan Sagin as Austin Dickinson and Sarah Kathleen Dunn as Mabel Loomis Todd. 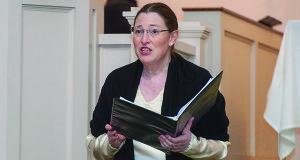 On October 19 and 20, the Music and Worship Committee of First Parish Unitarian Universalist of Medfield presented “Emily: A Chamber Opera Based on the Life and Works of Emily Dickinson” by Eva Conley Kendrick, the church’s award-winning director of music. Ms. Kendrick was inspired to research Emily Dickinson’s poetry and her family dynamic in order to create her contemporary chamber opera. The opera conveys Emily’s experience as an outsider in her strictly religious and traditional family, as she explores new ideas in her poetry. Her family trivializes her poetry by reading it aloud to a suitor and having it published in the newspaper. Emily feels that only the Reverend Wadsworth, as a fellow writer, truly understands her work. She respects his opinion and enjoys conversing with him about writing. She does not find this same understanding with the suitors that her family has invited to meet her. Meanwhile, her sister-in-law, Susan Dickinson, struggles with having to maintain the impression of a successful traditional marriage, while her husband, Austin Dickinson, carries on an affair with Mabel Loomis Todd. The dramatic arias and an energetic sextet advanced the storyline, while allowing the brilliant voices of the cast to shine. Ms. Kendrick’s score was lyrical and lush, using unexpected chord progressions and key changes that seem to echo the original thinking and jumps in Emily Dickinson’s poetry. Becca Kornet, as Emily Dickinson, brought a powerful independence to her role with her clear, ringing soprano. Sarah Kathleen Dunn embodied the role of the flirty mistress Mabel Loomis Todd, and her accomplished voice soared to beautiful heights. In the role of Austin Dickinson, Ethan Sagin illuminated the complex relationship of Austin and his wife Susan with his rich, expressive baritone. First Parish plans to present a series of music programs during the year. Lovers of music would be wise to follow their announcements for high quality music programs taking place right in the town of Medfield.